Diggers Valley: 6 October 2007. The week beginning the 6th of October 2007. 416 had her third calf early this morning and was cleaning up by the time I found her. 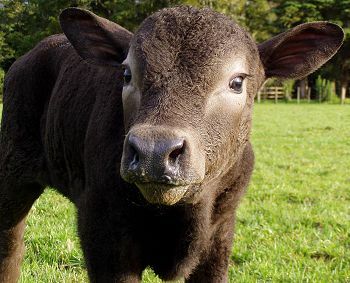 This little white-faced baby is our first bull for the year, after a run of six heifers. 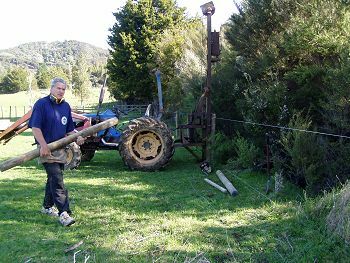 We fenced off 20 acres of regenerating bush a few years ago, with the assistance of a grant from the Regional Council. We put just over 600m of new fence in, but for some reason we overlooked the 150m of dilapidated fence along one side of the block, most of which is our property's boundary with a neighbour and a short bit is the top of our far flat paddock. There's a big drain on the bush side of our bit, so the cattle have never gone into the bush from here, but our neighbours are less concerned about their cattle availing themselves of some free grazing when we're not looking, which isn't doing anything good for our bush. The whole fence needs replacing and Stephan has started with the section in Flat 4. It has been a beautiful day, sunny and warm with clear blue sky all day long. 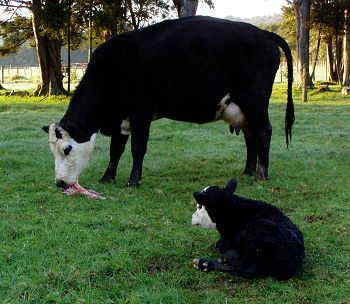 For about an hour of it I sat on a bank in the Windmill Paddock and watched 349 give birth to a bull calf. By 9pm we'd had the third calf for the day, from 449, a heifer. There are now nine calves. I was sitting writing at my computer and heard a scratching noise from behind me in the corner. 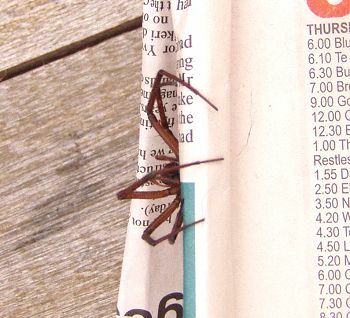 It sounded rather like there might be a mouse, but it was a creature with much bigger legs! 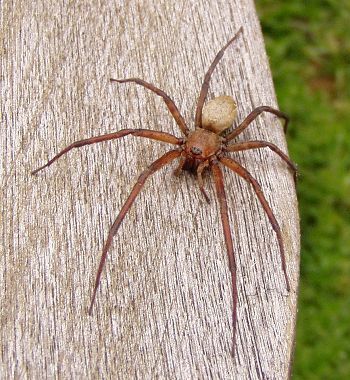 I'm not dreadfully nervous about spiders, but am not terribly keen on them either, especially when they're large or poisonous. This one is just large. Now it has been moved outside and I hope it hasn't left a family in my office. I think my animals like to alarm me. I persist in thinking they're dead when they do this, even though that's hardly ever the case. 517 looks very uncomfortable. I wonder what it feels like for her floating passenger? 416's new bull calf is doing what's called lying in. 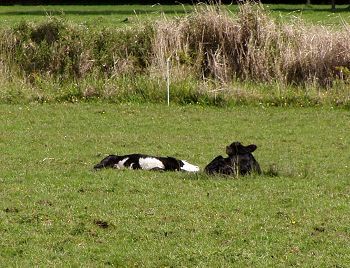 For about the first three days of a calf's life, it will do a great deal of sleeping, usually tucked away somewhere safe and warm where, usually, only its mother knows it is. 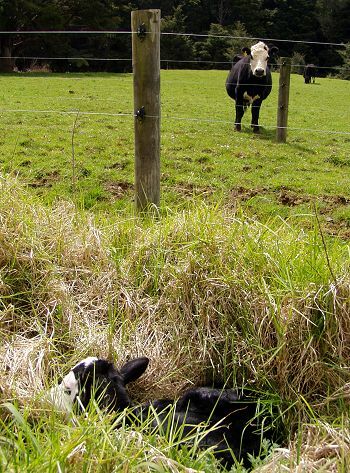 I spent ages yesterday afternoon looking for this calf when his mother was calling for him, and eventually discovered his hiding place, to which he continues to return between feeds. He has pushed under the Windmill paddock fence and then under the wires on the other side of the adjacent lane and is in the shallow ditch in the area we've fenced off for tree planting. Isla, pregnant, nicely covered, minding her own business out at the back of the farm. I think it's time we opened the annual Isla's Calving Date Competition! 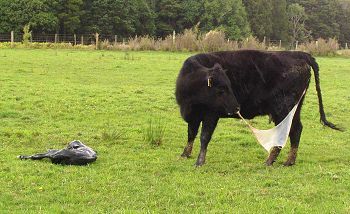 We sent heifer 494 off on a trip to Auckland this morning, so she's finally out of the way. I booked her in to the works weeks and weeks ago and for some reason there's been a very long delay. She'll soon turn up in the butchery departments of one of Auckland's supermarket chains and will make very fine eating. 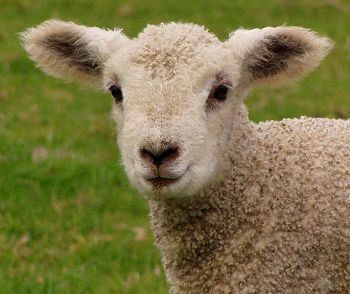 One of Yvette's lambs looks very much like she did when she was little, with dark eyelids and inner-ear skin. The face I see several times a day, as I continue to care for little Ingrette. At 3pm 517 was pacing one of the paddocks in early labour. She was still wandering around three hours later and whenever she lay down, nothing at all changed - she looked entirely relaxed and one wouldn't have known anything out of the ordinary was happening. I thought it wise to check what was going on inside her, so Stephan and I walked her out of the paddock with a couple of the other young cows and in to the yards. There were two feet and a live head there, so I let her out again and hoped she'd get on with the job soon. She didn't, at least she didn't for a very long time! Eventually, at around 10.15pm, she and I delivered a bull calf, which was very soon up on his feet and looking for a drink. 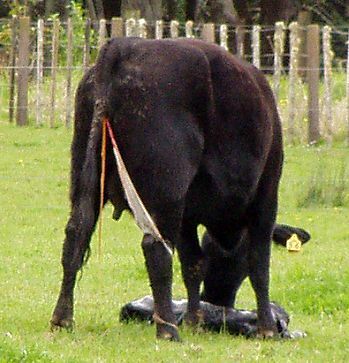 Back out on the farm, 390, who had a dead heifer last year, had produced a bull calf to the insemination sire Ardrossan Connection X15. 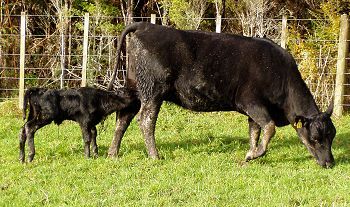 As a non-pedigree cow, I had hoped she would have had a heifer, since the bull will be steered, but a live calf will do. One of the young cows in the yards was looking a bit anxious to leave, so I opened the gates and made sure that 517 and her calf walked quietly together to their paddock. 486 is with them, and Dot 30 had already gone off ahead. Dot 30, who was the anxious cow in the yards, got on and had her calf over an hour during which I was watching her younger sister, Delilah 36 going through a very slow labour in an adjacent paddock. 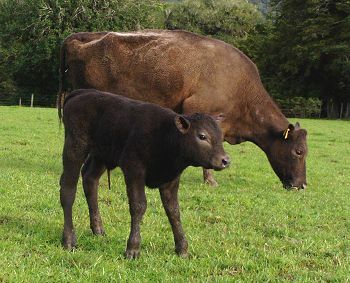 The two of them are Abigail's daughters; Dot is three and had a very unsatisfactory calf last year and has just produced another bull, and Delilah is one of the two-year-old heifers, in calf to low-birthweight sire Te Mania Prince. Delilah lay and pushed for hours with only a couple of feet showing. I was sure enough that they were the right sort of feet and that there was a head just inside, so left her to it, since she wouldn't let me help her in the paddock. But around 4.30pm she started looking pretty uncomfortable in her back end, as if she was suffering some nerve pinching and at 5pm I watched her from the house as she staggered backwards and went down. Stephan had just arrived home and so the two of us dashed across to the paddock to help her. The calf's head was almost out to its widest point, so she didn't have far to go and when the two of us grabbed and pulled a leg each, the calf was soon born. 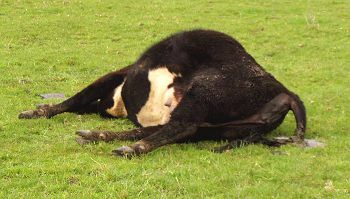 Delilah just lay there, flat out, for several minutes, but eventually got to her feet without any noticeable difficulty and began licking her calf, a bull. The calf didn't get up and was still lying down late in the night, but he seemed otherwise fine, in the care of his very attentive mother. We weighed both the calves born this afternoon: Dot's bull was 36kg and Delilah's 31kg. While we were at it, we also weighed 517's calf: 35kg. The two heifers' calves are not huge, so I'm quite concerned about their having needed assistance. Having had eleven two-year-olds calve without any bother last year, my confidence is shaken by the first of this year's five needing help. The five of them were bigger at mating than some of those in the previous year and they've appeared in good condition all through this year. Something has gone awry and it's probably something I've done. I think I might have underfed them over the last couple of weeks, as the grass has failed to grow quickly enough to keep up with the increasing needs of the animals. I was feeling pretty happy with their body condition coming up to calving, but suddenly a couple of them look a little thinner than I thought they were. Ingrette fell over during a feed this evening, but managed to get back up on her own, which is fantastic. Otherwise she had a mediocre day. I'm just continuing her care because I don't know what else to do right now and every now and then she appears to improve. To wrap up the day, 394 produced the third (bull) calf for the day and he was up and drinking within 20 minutes of his birth, even though his mother dropped him on his head. Delilah's little bull calf was up, feeding and walking around this morning, so all's well on that front. There's a family of Pukeko out in the Pig paddock with three chicks. I think there are three parents associated with them, although there are other birds around, so the family group may be larger than that. The babies are dashing off less quickly into the bushes, as they get older and bolder. They're fun to watch. Three-year-old 486, mother of last year's water-baby calf, had a bull calf this morning, as did Irene. Irene's udder is a ridiculously huge size and she looks very uncomfortable. It is very hard to the touch. Her calf is a small one again at only 34kg. Irene is a big cow, so her calves always look tiny next to her when they're born. Irene is Taurikura Irene 698 AB, one of the cows I bought from the Takou Bay stud a few years ago. This calf is a full brother to last year's heifer (Irene 48), sired by Ardrossan Connection X15. I think this is an indication of a heifer without very much milk. 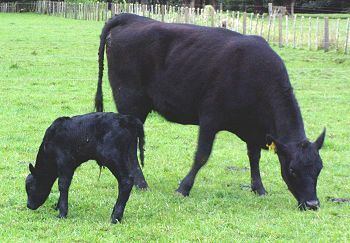 The calf is constantly feeding, often from behind as he follows his mother around while she's grazing. Delilah's udder is not very big and I think that like her elder sister, Dot, who had no visible udder at all at her first calving, it will be a little while before her milk "comes in". Delilah has a very good milk EBV, as do both her parents, and her mother, Abigail, has an excellent actual supply, so I doubt it will be a problem for very long. White-faced 470, who had a late reprieve from being sent to the works, produced a black heifer calf this evening and soon afterwards Fuzzy 357 had her own heifer and it isn't black. Fuzzy 357 has, I believe, a condition called hypotrichosis, commonly known as rat-tail syndrome. 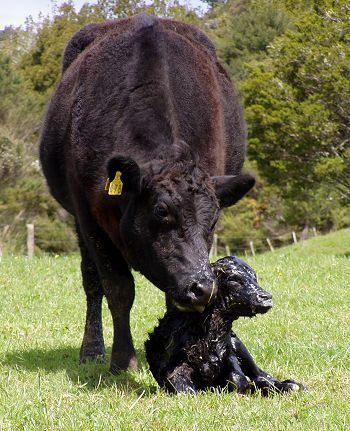 In her life so far she has produced two fuzzy bull calves and two straight-haired black heifers (she's half Angus herself) and now she's produced a double for herself in this fuzzy heifer calf. 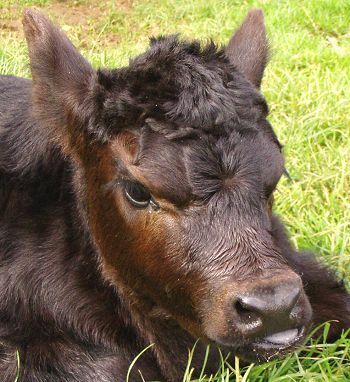 I have thought of culling 357 because of this genetic fault, but it causes very little bother, since our climate is not dreadfully cold and other than going bald in places during their first few weeks of life, her calves seem to be as well covered with hair as she is. 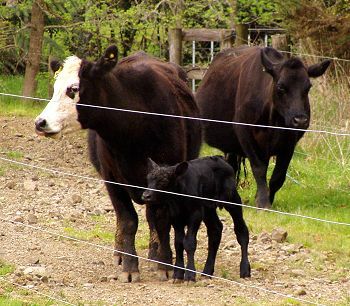 The calf's sire is #43. 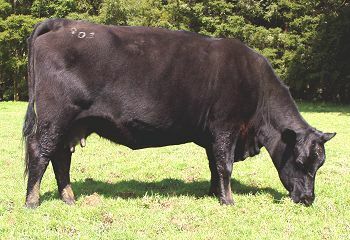 This is 478, our one daughter of Crispin, the bull I bottle-raised back in 2002. Last year, as a two-year-old, she had a reasonably good steer calf, so I was pleased to discover that this year's baby is a heifer. The calf's sire is #26. I thought we'd had a whale stranding on the flats this afternoon. From a distance 416's white-faced bull calf looked for all the world like a small Orca. My mind completely ignored the appearance of the calf with obvious ears sitting next to him. Demelza very quietly produced a bull calf this evening while I was out walking around checking the rest of the cattle. The calf-count so far is 20 of an expected 44.